It was a case of double trouble when I met Katie for a We Love Drinks special at Equinox‘s Chocolate Happy Hour. As two of the food and drink fanatics here at We Love DC, we thought it would be fun to head out together to one of Katie’s favorite spots, a place I’d actually never been. And it did not disappoint. Finally we were able to nab seats and properly toast farewell to winter with the last of the rich chocolate cocktails – one white chocolate with chambord splash for me, and one dark chocolate with sea salt for Katie. “Hello Saturday morning!” she quipped, and oh yes, these were pretty potent for girly cocktails. Happily not too overtly dairy, just the right taste of cream and salt for a chocolate cocktail. Now, the goodies. All happy hours must deliver on the goodies. I was pleasantly surprised that sitting in the bar area and ordering just two appetizers got us an amuse bouche. How gracious, not to mention delicious – glasses of mushroom bisque pared with spoons of tuna tartare. 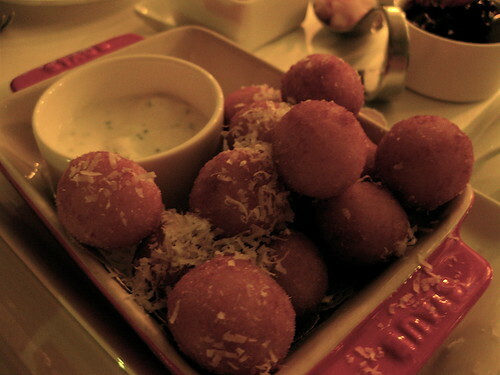 Our cheese plate was a good selection, but the true standout - the risotto fritters (or arancini) – little balls of deep fried rice and cheese. Ridiculously perfect in their shape, it was almost a shame to devour them as quickly as we did. Almost. Round two I decided to test our bartender with what I consider the dealbreaker of drinks – the dirty martini. Incorrectly mixed and it can kick your tastebuds to the curb, slur your speech patterns and send you to the porcelain temple in minutes flat. Or, just make you do the unhappy sour face. I’m happy to report it was beautifully done, very smooth, with no ill effects. One precious little cheese plate later and it was time to call it a night, if not head to the Y for a workout. How did drinks morph into dinner? That’s the mark of a truly good happy hour. You headed to the Y after you left?! Dedication, Jen, dedication! Mmmm…this post is making my mouth water. 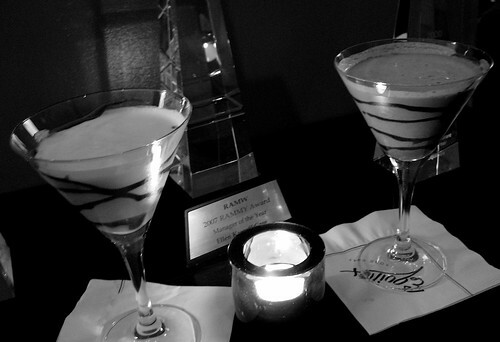 Chocolate happy hour, does that mean reduced prices on those delicious-sounding martinis? Oooo, um! I’d heard about that happy hour and hadn’t made it yet. Must put “chocolate cocktails” high on the list. I called last night after reading this! And they said the switch was either this weekend or next, he wasn’t sure. But he did mention something about rum and cherry ice cubes, which sounded equally intriguing. Thanks again, Jenn!